The Northmont Middle School Science Olympiad teams celebrate their fourth place win at the regional competition at Piqua High School on Saturday, March 16. The team will go to state competition at The Ohio State University on April 27. 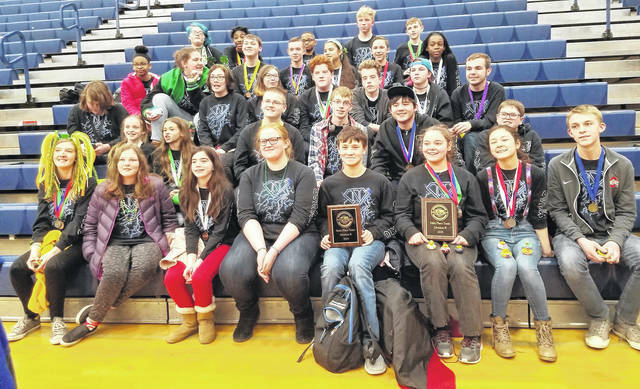 PIQUA — The Northmont Middle School Division B Science Olympiad team will make a trip in April to the Ohio State Competition, after placing well at the regional competition in Piqua on Saturday, March 16. The winning Northmont Division B team placed fourth at the competition, finishing with 131 points, only sixteen points away from the third place team, Hadley E. Watts Middle School of Centerville. Tower Heights Middle School, of Centerville, won the competition with a final score of 71 points. At the Regional Competition, students earned medals for sixth place and higher. The top scoring Northmont team medaled in fourteen events, and placed in the top ten in an additional six events, giving the team a solid point base to support their run for State. The high performers of the day were ‘The Chemistry Kids,’ with the two Northmont teams taking a sweep, winning first and second place in both ‘Crimebusters’ and ‘Potions and Poisons.’ Ninth grade students Lena Edwards and Sydney Gross took the gold in ‘Crimbusters;’ while eighth grade students Jordan Tucker and Lia Yang earned silver. Shortly afterwards, Yang, with ninth grade partner Andrew Marcum scored first in “Potions and Poisons;” and eighth grade Kollin Borger paired with ninth grade Ben Loudenslager to place second. “Both teams were excited and were very well prepared for all of their events. We placed in events that we have never placed in before. I’m proud of all of them!” said head coach Jim Witters. Currently there are 45 students, in grades 6 – 9, participating in the Northmont Division B Science Olympiad program. Thirty of these students were chosen to compete in the Piqua Regional Competition. A final fifteen member team from the program will head to The Ohio State University on Saturday, April 27 for state competition. The Northmont Middle School Science Olympiad Team receives generous support from several local business donors, including First Financial Bank, the Northmont Rotary Club, Ratliff Metal Spinning, and Vancon General Contractor. Students interested in any of the STEM programs are encouraged to contact their school office for information regarding how to join the Science Olympiad teams next year.